Pizza 101 – Impress Yourself! There is a reason that Ellen DeGeneres ordered pizza during the 2014 Academy Awards ceremony. Who doesn’t love pizza, anywhere, anytime? No doubt you’d like to know the secrets to making a great tasting pizza. Welcome to Pizza 101. No dialing required. Preheat oven with pizza stone, if you have one, at 500F. If not, use any flat baking tray. Mix the sugar into the water in a large bowl. Add yeast to sugar-water. Leave it to rise and bubble for 10 minutes. Add 2 cups of flour to the yeast mixture and stir slowly, scooping down the sides of the bowl. Mix to slightly lumpy. 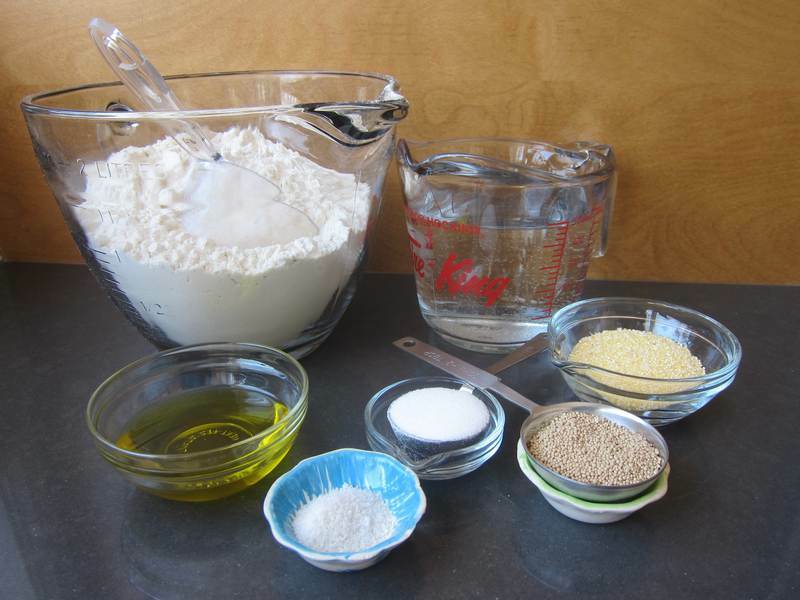 Add an additional cup of flour, then 1/2 cup more, and 1/2 cup more, mixing it in with a wooden spoon. Then, use your hands to fold the dough and add small amounts of flour until it barely sticks to your hands. Add 2 tablespoons of olive oil and salt into the dough. Form into a ball in the bottom of your mixing bowl and cover the exposed top with 1 tablespoon of olive oil, then plastic wrap or parchment. Cover the bowl with a dish towel and leave for 45 minutes to rise. Put a handful—one-quarter— of the dough on a floured surface. Coat both sides of the flattened dough and your rolling-pin with a little flour. Roll and flip the dough several times, creating a thin crust of any shape. Place crust on a sheet of parchment paper sprinkled with a little semolina. Put a little tomato sauce on the dough – about 3 heaping tablespoons. Sprinkle on a few grilled vegetables. Cover with a light dusting of cheese. Cook pizza at 500F for 5 – 8 minutes until crust begins to brown and cheese is bubbling. Remove from oven and let pizza set a few minutes before slicing. Makes 4 pizzas. Serves 8. Pizza 101 is inspired by pizza maven, Melanie McCready and my foodie buddy, Liz Joffe. They have years of experience drawing people together over their perfect pizzas. 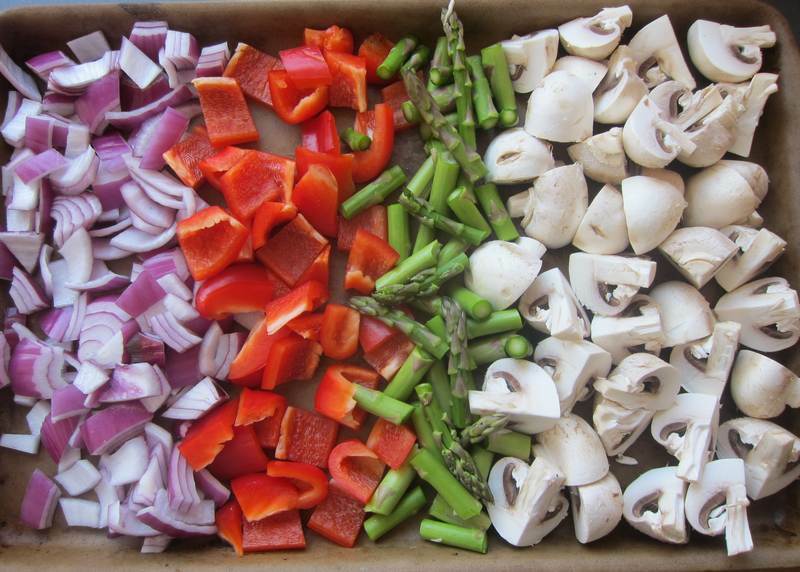 You can roll out and freeze dough and even freeze toppings (except for fresh tomato slices). You can make pizza in advance, freeze it, then cook if frozen, if your oven is hot. Freeze extra tomato sauce and grated cheese. 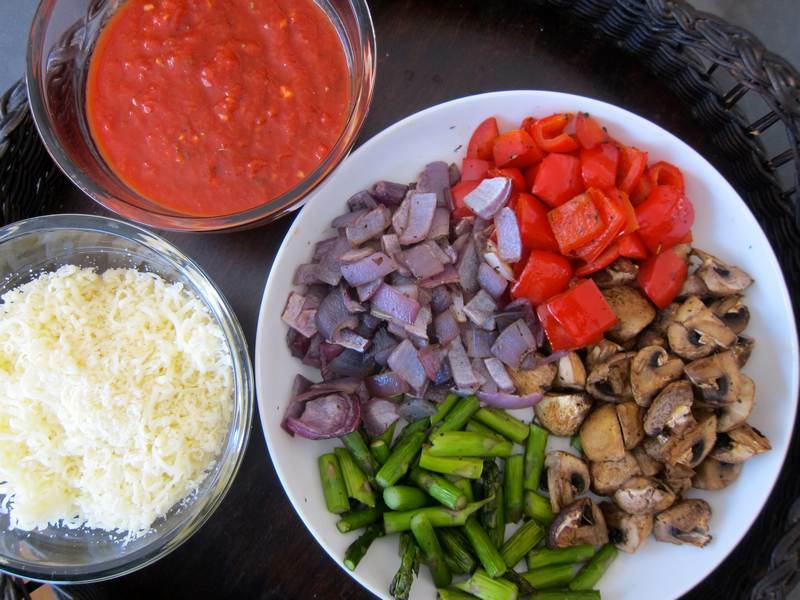 Are you curious about using metal bowls and utensils for pizza dough? The Paupered Chef can tell you how to make your own pizza stone for just $3. We both had pizza on our minds this week. Nothing like homemade pizza. I’m planning to keep practicing with all sorts of pizza recipes so that it becomes as natural as making toast. March is Nutrition Month so i cannot help myself from suggesting that you replace half the white flour with whole wheat flour. Proportions are same for rest of recipe and it adds a bit of a nuttier flavor to the crust. Will do! 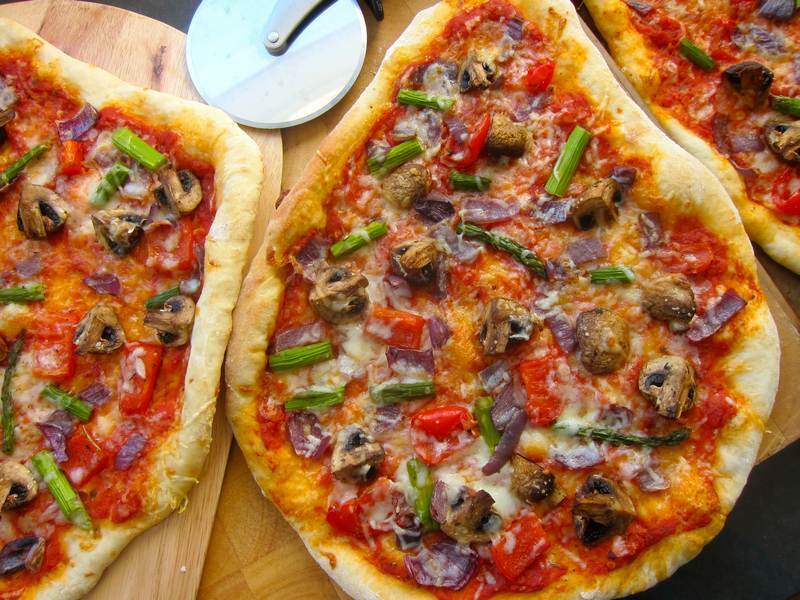 And will post more pizza recipes using different – healthier crusts. This was just 101 – and delicious!! Your finished pizzas look wonderful and your toppings are probably what I would choose as well. Homemade pizza is so much better than what is delivered in my area. Although if you talk to my Mom who grew up in Brooklyn, she’d say there’s nothing like a slice from a pizza parlor there! Thanks for liking the pizzas! Labour of food love!! Thanks foodie friend! You got the ball rolling. Got tired of saying double-ex-sister-in-law. I have been thinking of making a homemade pizza for a long time. I will pull out my pizza stone. You are a mind reader in addition to being a wonderful and entertaining chef. Thank you. I’ve never been called a mind reader before. I do have a crystal ball. I’m pretty sure that almost everyone dreams of making homemade pizza and is just waiting for that little nudge to put them into the right frame of mind. Thanks for the wonderful and entertaining, Sondra!. I’m going to stick with cook though, rather than chef. easiest way to grate mozarella is if its lightly frozen, throw it into the freezer while you are preparing ingredients. And, you are back!!! Missed your voice. When’s my next lesson?